Lynx Technology Partners Awards the First Foundation Endowment Scholarship at the Inaugural International Consortium of Minority Cybersecurity Professionals (ICMCP) Conference. New York, NY— April 11, 2016 — At the Inaugural International Consortium of Minority Cybersecurity Professionals event, Lynx Technology Partners awarded the first $5,000 educational endowment from the Lynx Technology Partners Foundation to help talented women and minority students advance in their cybersecurity studies. 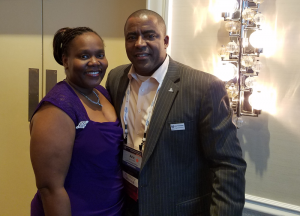 The award was presented to Stephanie Carter, a 20-year Army Veteran and single mother, and will enable her to continue her cybersecurity studies and earn certifications to help launch her career in Cybersecurity. While the original intent of the Scholarship Endowment was to provide funding to undergraduate education, Stephanie’s qualifications and drive allowed her to shine and receive the award to support her dual Master’s Degrees in Cybersecurity. The International Consortium of Minority Cybersecurity Professionals (ICMCP) is a 501(c)(3) non-profit organization. It began official operations in September 2014 and is organized exclusively for charitable purposes to provide members with educational/technical scholarships, mentoring opportunities, professional development, and networking.